With an Oscar nomination for his turn as the legendary blacklisted writer Dalton Trumbo in last year’s Trumbo, Bryan Cranston has proven that he can bring the same magic to the big screen as he did as troubled meth dealer Walter White in the much-loved series Breaking Bad. 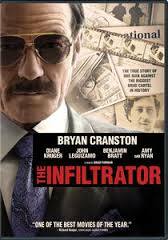 Bryan Cranston stars as an undercover U.S. Customs agent The Infiltrator. The latest example of Cranston’s ascension to leading man prominence is his turn as real-life Florida-based U.S. Customs agent Robert Mazur in the involving suspenser The Infiltrator. Set in the 1980s, the focus is on Cranston’s government operative trying to nail the drug cartel of Pablo Escobar by posing as a sleazy banker who does business with the notorious Medellin cartel. Director Brad Furman (The Lincoln Lawyer) keeps things moving and adds some interesting angles, although by film’s end, things eventually wind up in the thriller cliché junk pile, and the movie feels more like a made-for-cable film than a theatrical release. The most involving sections center on Mazur’s issues with leading the double life as both a family man and an amoral money man in cahoots with criminals. Adding color to the proceedings are Diane Kruger (Farewell, My Queen) and John Leguizamo (John Wick) as his associates, Juliet Aubrey (The Constant Gardener) as his long-suffering wife and Yul Vasquez (Kill the Messenger) as a cartel thug. 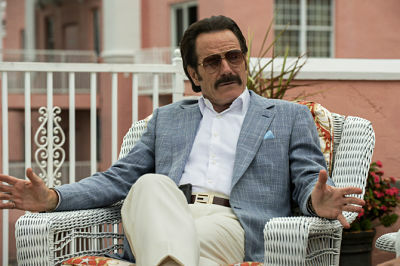 Credit should go to Cranston and Furman (whose mother actually supplied the screenplay here!) for delivering an often hair-raising, stranger-than-fiction thriller that isn’t a reboot or a remake of an old movie or TV show—even if it does feel like one at times.